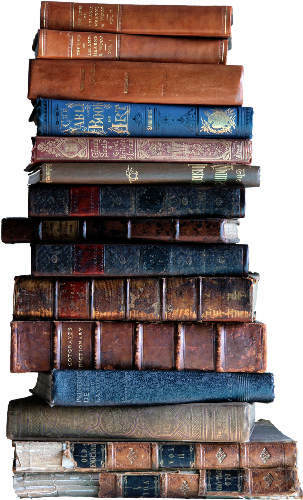 [gallery type="slideshow" ids="1552,1550,1555,1551"] Four novels, all set to be published this summer. All four are probably not to most people's reading taste but they all were to mine. Queen's Gambit is the story of Katherine Parr, the final and surviving wife of Henry VIII. She's got an interesting story and it's told well both from her perspective and that of a servant, Dot, whom she brings from her own household to serve her when Katherine (reluctantly) becomes Queen. Even if you think you've read or watched everything you need to about the Tudors, this is worth a read, especially since it covers a relatively unexamined person and part of the story. Its perspective on Elizabeth is especially interesting, both from Katherine's view and from Dot's. As everyone who knows anything about Elizabeth knows, she and her final stepmother were close -- until Katherine caught her last husband, the ambitious, vain Thomas Seymour, playing some sort of naughty bed game with the young adolescent Elizabeth. While Katherine was pregnant with his child. I was dreading that part of the story even though I knew it was coming -- but Fremantle handles it with an interesting approach. A debut novel by Elizabeth Fremantle, who appears to be a worthy addition to the Tudor-writing historical fiction ranks. The book is scheduled for release on Aug. 6. Blood & Beauty is about the Borgias, another telegenic Renaissance-era family (also the subject of a pay-cable drama from the same folks who brought us The Tudors). Sarah Dunant sets her books in medieval and Renaissance Italy and the Borgias offer incredible scope. I knew little about them, beyond their historical reputation as a bunch of depraved poisoners -- this book provided a much better rounded portrait especially of Lucrezia, daughter of the ambitious Rodrigo Borgia (Pope Alexander VI). Even her ruthless brother Cesare is understandable, if not necessarily sympathetic. I enjoyed it thoroughly and look forward to the next installment -- though it led me to some confusion over the dramatic choices in the Showtime series. But hey, I knew from watching the Tudors that the guy behind those shows is not all that concerned with historical accuracy so I'm going to assume Sarah Dunant's sticking closer to the record until I learn otherwise. Dunant is probably best known for In the Company of the Courtesan; she may go stratospheric (into Philippa Gregory-like sales levels) with this one. Blood & Beauty publishes July 16. Blood of Tyrants is speculative/alternative/fantastic historical fiction -- the latest and apparently penultimate volume in Naomi Novik's Temeraire series. I've blogged about this series before -- the previous entry, Crucible of Gold was one of my favorite books from last year -- and this is a worthy successor. As it opens, our hero Will Laurence has been shipwrecked on the shores of Japan and has amnesia. So even though most of his shipmates and fellow aviators think he's dead and "his" dragon, Temeraire, desperately wants to find him, Laurence thinks he's still an officer in the British Navy and has no memory of the last eight years, ie. the time he's spent with Temeraire and learned a hell of a lot about dragons (and encountered Napoleon personally, and been court-martialed, and been made a prince in China and nearly died in both Africa and Australia and ... well these are adventure books, OK?). The series is often described as Patrick O'Brian with dragons and that works -- it's set in the British military during the Napoleonic wars. And it is cool to imagine military aviation coming into play a few centuries before it actually did, and how that might have altered things and worked in the culture of the time (few know it outside of the aviation corps, but there are a number of female officers because one particularly valuable breed of dragon, the poison-fanged Longwings, will only abide women as their captains). But the true appeal of the series, for me, is the way it fulfills an animal lover's fantasy of bonding with intelligent, emotional beings who can, in this world, speak and express their opinons, sometimes irrational as they may seem (all dragons covet treasure and want to see their humans kitted covered in the Regency-era equivalent of bling whenever possible). I found myself, when reading this book, thinking of the relationship I've had with dogs and horses and how it often feels like you are holding conversations with them -- and how you feel a responsibility for their care and happiness that goes far beyond mere ownership. It will be interesting to see how Novik winds up the series -- this book ends with Napoleon on the march in Russia but she has previously shown no problem with materially altering history (Napoleon is currently married to an Incan princess) and kudos to her for the last line, which I won't spoil here but which has to be a nod to that other dragon-loving fantasy writer, George R.R. Martin. Blood of Tyrants publishes on Aug. 13 -- if you haven't read the previous seven entries in the series, that would make an excellent --and fun! -- summer reading project. I will be sorry to see this series end but will try to view it as I do my favorite TV shows when they go away after a few seasons -- better to go out with quality than trail on forever just because someone is willing to pay you to do so. One of these books is not like the others, as the old Sesame Street ditty goes. Men in Miami Hotels is a contemporary noir, set in Key West but it's a wholly different creature from the usual subtropical mystery/detective novel -- it has more in common with the work of Thomas McGuane than Carl Hiaasen or James Hall. Cot Sims is a journeyman gangster for a Miami crime lord. He returns to his hometown of Key West to help his mother, who has been kicked out of her hurricane-damaged home by code enforcers and is camped out underneath. 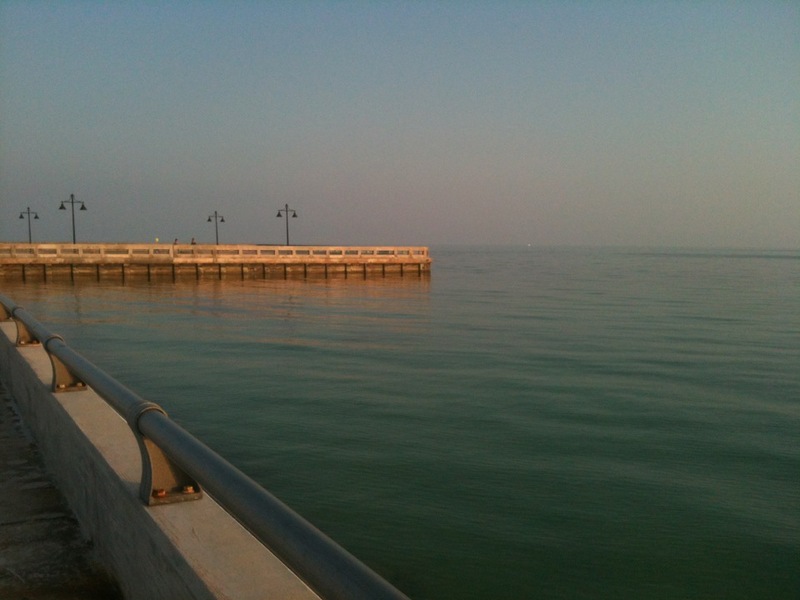 It is recognizably Key West in a lot of keenly observed ways, though a smaller less transient -- and more violent -- island than the real one (it appears to be a Key West inhabited entirely by Conchs and visiting Miami gangsters). Sims quickly gets himself into serious trouble by stealing a bunch of emeralds from his Miami crime boss and is basically on the lam from then on, throughout Key West, mainland South Florida and eventually Havana. I particularly liked the action in the cemetery, where Cot spends some time hiding out in a friend's family crypt. I'll admit that I admired this book but didn't find it captivating the way some crime fiction that is considered genre can captivate me (most recently, Lyndsay Faye's Gods of Gotham). But for those who prefer their crime with a more literary approach, or who read in order to admire language, this is a great read and I hope it finds its audience. It deserves to. Men in Miami Hotels will be released July 2. My fourth Letter from Key West ran today on WLRN's Under the Sun program. Special thanks to Trina Sargalski and especially to Alicia Zuckerman for her always deft editing -- and for contributing, in the studio while we were about to record, what turned out to be my favorite line in the whole piece (In summer, there's more light and more time.) Alicia gets special extra triple credit, along with Dan Grech, for creating Under the Sun and helping South Florida realize its radio potential. It's been a real pleasure to listen and to take part. Besides Alicia's line, my favorite part of the piece might be that photo -- because it really does say summer to me, which is why I shot it with my iPhone a couple weeks ago and posted it to Facebook -- all while walking the dog. The other photo illustrating the piece, of some mangoes on a table at The Studios of Key West, also came from my iPhone. Both of them were total punts because last week, when I should have been collecting photos to illustrate summer in Key West, was a washout from what would become Tropical Storm Debby. But I think it worked out. 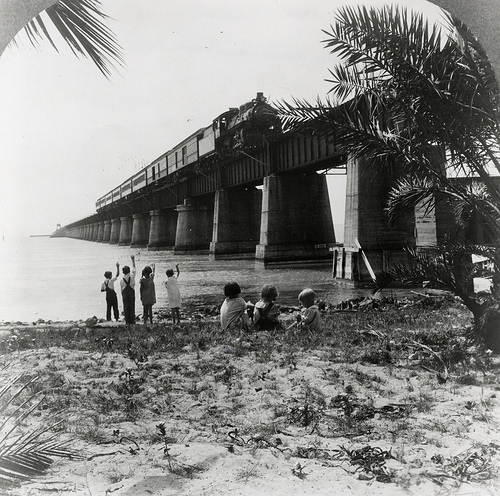 Exactly 100 years ago, Key West was in a tizzy, getting ready for the arrival of the First Train. On Jan. 22, 2012, the train would arrive bearing oil tycoon-turned-railroad magnate Henry Flagler and marking the completion of the Over-Sea Railroad. These days, we're in a bit of a tizzy ourselves, getting ready to commemorate the Centennial of that event -- a major one by the standards of any small town and, you could argue, in the history of Florida and the nation. It was certainly a remarkable achievement, crossing mangrove swamps and open water. Crews endured hurricanes, mosquitos and the relentless humidity of the subtropics -- without the modern comforts we take for granted now. Lots of events are planned to mark the Centennial -- more information is available at the official Centennial committee's website. At the Key West Library, we're celebrating with our One Island One Book program. This year we're reading Last Train to Paradise by Les Standiford, which tells the story of the construction of the Over-Sea Railroad -- and its destruction, barely two decades later, when the Upper Keys were hit by one of the strongest hurricanes ever to strike the continental U.S. Most of our One Island One Book events don't start until mid-February -- Standiford will be speaking at the Library on Monday, Feb. 27. But one event is starting in the next few days: our first every online readalong. What does that mean? It means you read about 50 pages a week of the book (there's a reading schedule on the blog), and comment about it at the blog. We'll start things out with some comments and questions but this isn't a class and our posts are not a syllabus -- everyone is welcome to chime in on whatever aspect they like, from wherever they are. So if you're curious about the railroad and feel like learning some more -- and interacting with others who are doing the same, please join in. Some of you, especially those familiar with the Keys, may have noticed that the image above does not show Key West. It's Pigeon Key, the island in the bend of the Old Seven Mile Bridge (and one the best places these days to get a feel for how things were back in the railroad days). Even though it's not Key West, this is one of my favorite images of the railroad, probably because of the human element introduced by the kids waving below. And it comes from the library's spectacular collection of historic images that have been scanned and placed online for open public access -- including a collection of 700 images about the Over-Sea Railroad. Many of the library's images, incidentally, were used for a beautiful new Centennial edition of Last Train to Paradise, published by Books & Books and the Flagler Museum. 1) The Whiskey Rebels by David Liss -- historical fiction set after the Revolutionary War, as the Hamiltonians and Jeffersonians duke it out for the future direction of the young country and regular folks are collateral damage to some of the duking. It's the title for the November Book Bites Book Club at the Key West Library so we have lots of copies. The group meets Nov. 10 at the Library. 2) Last Train to Paradise by Les Standiford -- it's going to be our One Island One Book choice for 2012, timed to the Centennial of the Overseas Railway reaching Key West. Les will be coming to talk about the book and we'll have other programs around that time -- there will be lots more information in the future at our One Island One Book blog. Bookmark it! 3) Any or all of the writers coming to the Key West Literary Seminar in January 2012 -- it's an amazing bunch especially if you're into the speculative fiction -- superstars like Margaret Atwood and William Gibson, Pulitzer Prizewinners like Jennifer Egan and Michael Cunningham, new voices like Dexter Palmer and Charles Yu, guys with hot new zombie titles like Colson Whitehead. It's going to be extraordinary. It's sold out, I'm afraid, but there will be free sessions on Sunday afternoon, as always. And the Seminar will post the audio from as many sessions as we can on our ever-expanding archives.